We took some time away from working on new features this week to address test failures which had been building up. These tend to be tricky issues to fix since they are often hard to reproduce so require a lot of effort to identify the cause. We have fixed 30 of these issues this week and we will be continuing to address these issues in the coming week as well. 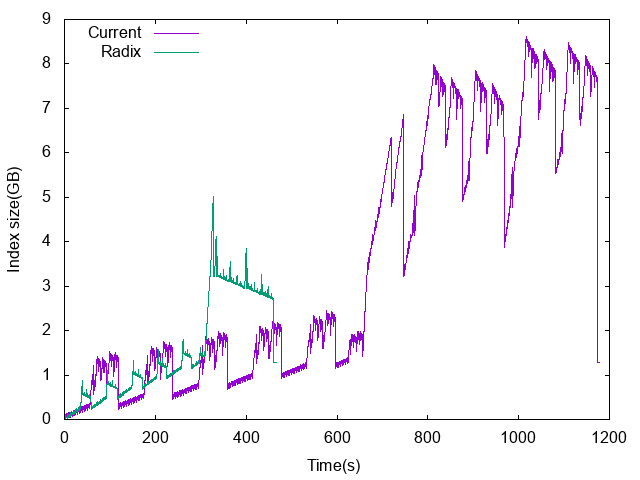 Work has continued on speeding up indexing throughput of BKD trees. A nice side-effect of this is that range fields in ES should also see an improvement since they use the same data structure (e.g. 2D points in BKD tree). We have completed the work to migrate to using Java time, pushing the necessary changes for Watcher and Monitoring. There have also been severalfixes and we also fixed a performance issue in the aggregrations code. Currently, there is an open issue around a change in the date formatting of the date histogram aggregation and we need to document the expected changes / restrictions (e.g. due a bug in JDK 8, the timezone "GMT0" cannot be properly parsed (fixed in JDK 9)). Related to the jave time migration above, a new field type will be available in Elasticsearch 7.0 called date_nanos that allows to index date at the nanoseconds precision. This field will be usable in sort, docvalues_field and script with the full resolution (nanoseconds), for aggregations the value will be downgraded to the milliseconds precision automatically. Adding more precision on the date field was a longstanding feature request that we were able to tackle thanks to the migration from Joda to Java Time. We are working on introducing default distribution benchmarks for our nightly results. Currently we either benchmark the OSS distribution or specific configurations with x-pack security with the trial license. There were some issues that alerted us that we also need to benchmark with the default distribution. Towards that, we've recently obtained new bare metal environments and we are working on a fair split of the workload per benchmark environment, necessary changes in night-rally (the tool to run nightlies) and changes in charts so that it's easy to compare results and maintain the history of earlier results. The last round of PRs were merged for types removal. This concludes the types removal changes we wanted to get in for 7.0. Going forward, we'll be keeping an eye out for bug reports, and are also working on solidifying the approach around typeless APIs. the order by gender DESC is pushed down to aggregations while MIN and AVG are sorted by SQL. Finally we have deployed new CI jobs for the ODBC driver so we can run both unit tests and integration tests in CI. 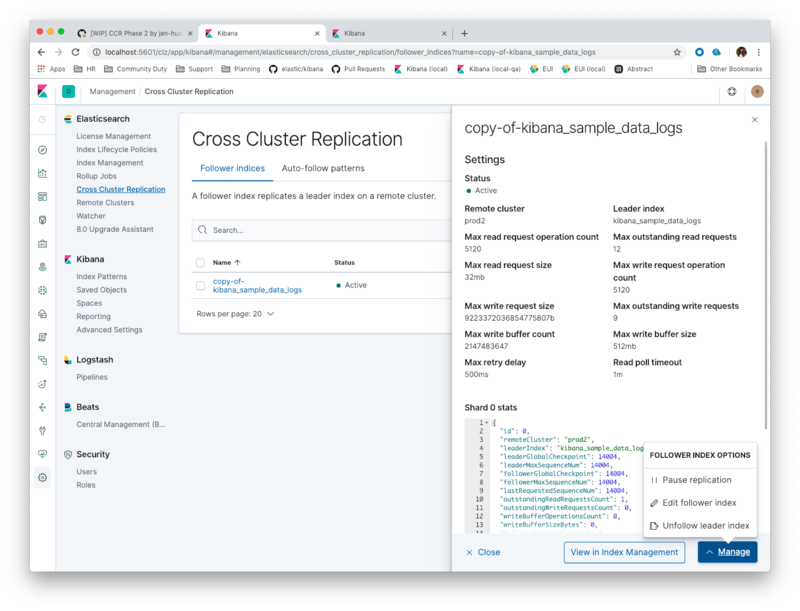 The follower indices section of Cross-cluster replication UI app is complete. In parallel with the cross-cluster follower indices, we also merged a few enhancements on the remote clusters app to better integrate it with CCR. This week we mainly focused on tidying the UI (copy, i18n and stakeholder review) and testing. 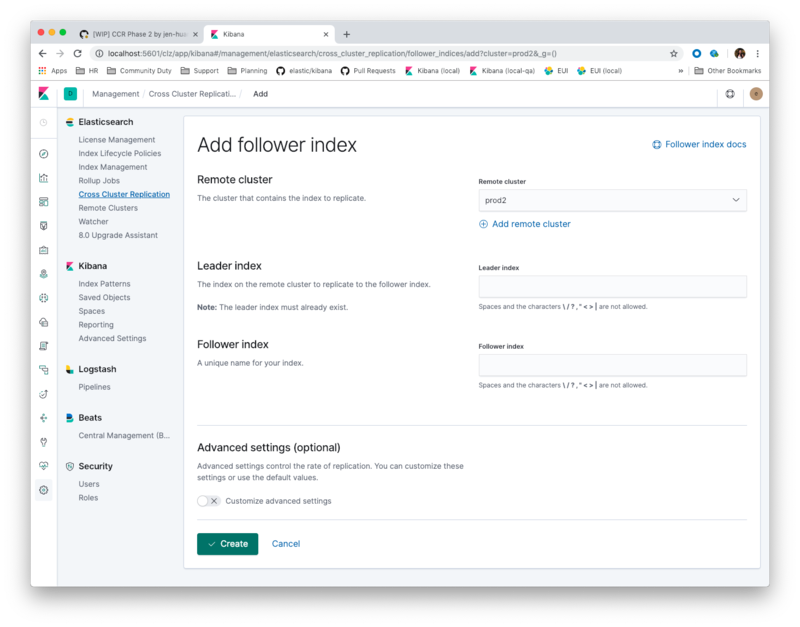 The UI also now supports re-opening a follower index after it unfollowed the leader index (a follower index has to be paused and closed before unfollowing a leader index). We have been benchmarking the recovery from remote functionality across high-latency connections. Initial tests also showed poor performance given the small default chunk size on a cross region link with high latency (~100ms). Increasing the chunk size helped, but was still not fully saturating the network links. The key missing ingredient was the parallelization of file chunk fetching. As CCR will often times be operating across high-latency networks, recovery from remote will require concurrent fetching of file chunks to better saturate network pipes. We added the ability to fetch chunks from different files in parallel, configurable using a new ccr.indices.recovery.maxconcurrentfile_chunks setting. With this change, the benchmarking is showing much more promising numbers. Further benchmarking in various configurations is ongoing. The file chunk size is now configurable and we have fixed twobugs found during benchmarking, one of which was causing recovery from remote to fill gaps in the history using NOOPs instead of fetching them from the leader. Kerberos support has been merged and will make the 6.7 and 7.0.0 releases! All ILM work for ILM/CCR integration has been completed, although we are still waiting for CCR to fully integrate shard history retention leases for it to be fully functional. The OAuth2 based tokens that Elasticsearch provides can only be refreshed a single time as an added security measure. This behavior is not specified by the RFC and is left for the implementation to make a decision. Unfortunately, this restriction caused issues for Kibana's SAML auth provider and a token-based auth provider. We discussed and came to a solution; in short subsequent client requests to refresh the same token that arrive within a predefined window of 4 seconds will be treated as duplicates of the original refresh and thus receive the same response with the same access token and refresh token that was issued for the first response. The authorization engines branch has been merged and backported. This allows users to plug in their own AuthorizationEngine to be able to control how authorization decisions are made on each request. The default mechanism is backed by role and the roles define how authorization decisions are made. A custom engine could make these decisions based on any mechanism the user wants. For example the user may have authorization information stored in an external system and not be able to sync the information stored there with Elasticsearch roles so could create a custom authorization engine to query the external system and retrieve authorization information. There is an ongoing vote to release Lucene 7.7 which is going well so far. Once Lucene 7.7 is out, we plan to immediately start a new vote for Lucene 8.0. There are some follow-up ideas how to optimize it further and indexing points as geo-shapes in the upcoming Lucene 8.1 will likely be almost as fast as indexing geo points in Lucene 7.x. A long term member of the Lucene community, started a thread about enabling Lucene to skip collecting documents if they are unlikely to make it to the top hits. For instance if you have 10 segments that are sorted by some field and want the top 100 documents sorted by this field. Today, Lucene will always collect 100 documents on this first segment, while the 100th collected document is actually unlikely to make it to the top hits globally. So a discussion started about how we can more generally allow users to trade accuracy for speed. Note that this is different from enhancements that have been brought to Lucene 8.0/Elasticsearch 7.0 which always return the correct top hits. equals/hashcode support was added to Lucene's TotalHits object. Lucene already supports searching multiple segments in parallel. Could we go further and leverage threads to speed up searching a single segment?